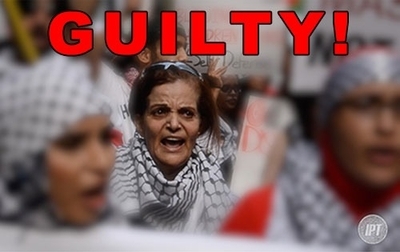 Palestinian terrorist Rasmieh Odeh, who faces a May 16 retrial for naturalization fraud, reportedly has agreed to plead guilty and leave the United States in exchange for avoiding any prison time. According to a statement from her supporters, Odeh "has made the difficult decision to accept a plea agreement." [Emphasis original.] The statement hailed the decision as "a victory, considering that the government had earlier fought for a sentence of 5-7 years." No court papers have been filed to confirm the report. **Update, a plea hearing has been set for April 25 in Detroit. Odeh was convicted in November 2014 and sentenced to 18 months in prison, the loss of her citizenship and deportation. The Sixth Circuit Court of Appeals sent the case back to U.S. District Judge Gershwin A. Drain in February 2016, ruling that he improperly barred testimony supporting Odeh's claim that she failed to disclose her Israeli conviction for participating in two 1969 Jerusalem bombings, including one at a grocery story that killed two Hebrew University students. Drain granted a new trial including the testimony, prompting federal prosecutors to issue a new indictment adding greater emphasis on Odeh's acknowledged membership in the Popular Front for the Liberation of Palestine (PFLP) terrorist group. Odeh's supporters treat her as a hero to the Palestinian cause. They have maintained that she is innocent of the immigration charge and insist she was not responsible for the 1969 bombings, even though she confessed and Israeli investigators found materials used to make the bombs in her home. That confession followed weeks of torture, they claim. But records from her trial indicate otherwise. She confessed within a day of her arrest, records show. One Israeli interrogator called her "an easy nut to crack" and testimony at her trial indicated she identified more than 80 fellow PFLP members who later were arrested. Thursday's statement casts prosecutors as the party hesitant to go back to court, saying they "clearly want to dodge a public and legal defense that puts U.S.-backed Israel on trial for its crimes against Rasmea and its continuing crimes against the Palestinian people as a whole." That bit of spin is challenged by aggressive steps prosecutors took in preparation for a new trial. In addition to issuing the superseding indictment, they hoped to depose two women who worked with Odeh in the attacks and publicly discussed their roles. Odeh served 10 years in an Israeli prison, but was released as part of a prisoner exchange with the PFLP. She made her way to the United States in 1995 and applied for naturalization as a U.S. citizen in 2004.She failed to disclose her terrorist arrest, conviction and resulting imprisonment despite specific questions about an applicant's past record. And she never told immigration officials she was part of the PFLP. During her 2014 trial, immigration officials testified that, had she answered honestly, she never would have been allowed into the country. On April 2, Odeh is scheduled to speak at an upcoming conference sponsored by a major BDS group, the Jewish Voice for Peace. Speakers on her panel include the rabidly anti-Israeli Palestinian activist Linda Sarsour.